The 2016 Summer Games were supposed to bring Rio and Brazil to new financial and athletic heights. What's left behind? A city and country shrouded by corruption, debt and broken promises. This story is also available in Spanish and Portuguese. Felipe Wu opens the door, apologizing for the mess. On the floor beside him sits a suitcase overstuffed with clothes. A few feet away, boxes filled with pistols and ammunition climb the stairs. There are shoes in the kitchen. Boxes in the living room. A hole in the wall where the air conditioner once sat. It is a home in disarray. A family that is about to move. The modest 860-square-foot home sits on a narrow street in the swanky Itaim Bibi neighborhood of São Paulo, the sprawling economic capital of Brazil. It stands in stark contrast to the tall, opulent buildings that line some of the city's richest streets. But in a few weeks, Wu will no longer call this place home. The small yard and garage where he trained to win Brazil's first Olympic shooting medal since 1920 will soon become a construction site. The narrow corridor on the side yard where he hung his targets and chased his Olympic dream for 12 years will meet its final fate: a bulldozer. Wu's home and the others on the block are scheduled for demolition, soon to be replaced by a pair of towers filled with luxurious condos, lavish homes that one might think would come with bringing home one of the 19 Olympic medals Brazilians won in Rio a year ago. But the success has done little to improve Wu's way of life. If anything, the Olympics have made it worse. "What I'm living now I couldn't imagine in my wildest dreams," says the 25-year-old Wu, who won the silver medal in the 10-meter air pistol event. "After reaching a good result, I felt a spark of hope. But it never materialized. It's sad. "We missed the opportunity to transform sports in Brazil, to grow all of the sports to a professional level and to engage children in sports, to build the next champions. It's all so disappointing." The 2016 Rio Olympics were supposed to be the second of a one-two punch announcing Brazil's arrival as a world power through dominance in sports. But in many ways, the opposite unfolded. Timed with an embarrassing political corruption scandal and the largest economic crisis in Brazil's history, the hosting of the 2014 World Cup and 2016 Games has resulted in a perfect storm of unfulfilled promises. While 15 of the original 27 venues have hosted some sort of event since the Games, others sit largely abandoned, their decay and disrepair a constant reminder of what was meant to be. Even the iconic soccer stadium, the Maracanã, has been vandalized, and had its power shut off completely after amassing a $950,000 electric bill. 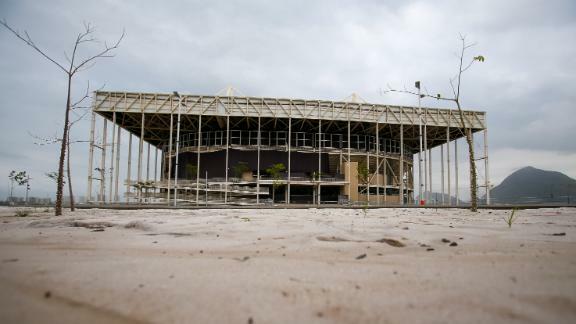 Deodoro Olympic Park, long hailed by Brazilian politicians and Olympic proponents as a path to upgrade one of Rio's poorer neighborhoods, is shuttered. The community pool that was supposed to come out of the canoe slalom course was closed in December and has yet to re-open. Brazil's Federal Court of Audit (TCU) reported last week that another abandoned pool, at the Deodoro Aquatics Center, is now covered in bugs, mud and rodent feces. A Deodoro elevator once used to lift fans over a busy road now leads to nowhere. The 2016 Olympic Games have left crumbling stadiums and debt instead of the promised financial and sporting benefits for Rio de Janiero and Brazil. Ten miles away at the Olympic Park, things aren't much better. Earlier this month a fire from a flying lantern torched the roof of the Rio velodrome, badly damaging its Siberian Pine track. After the Games, the city solicited bids for private companies to run the park, but no one bid, leaving Brazil's Ministry of Sport with the task -- and expense. The maintenance alone will cost the government approximately $14 million this year. Rio's new mayor, Marcelo Crivella, has scrapped plans to turn the handball arena into four public schools. And the 31 towers that made up the athletes village, which were set to be transformed into luxury condos, now sit largely vacant. Even some of the medals awarded to the athletes have tarnished or cracked, with more than 10 percent of them sent back to Brazil for repair. Rio officials blame poor handling by the athletes. Almost a year since the Games closed, the Rio 2016 Organizing Committee still owes $40 million to creditors. Bloomberg reported in April that the Olympic organizers were attempting to pay creditors with air conditioners, portable energy units and electrical cables. In July, the organizing committee asked the International Olympic Committee for help with its debt; the IOC said no. Promises that the Olympics would modernize Rio and make its streets safer and favelas cleaner have also failed. According to Brazil's Institute of Public Safety, street robberies are up 48 percent and deadly assaults by 21 percent, to the highest rates since 2009. In the first three months of 2017, violent crime spiked 26 percent compared with the same period in 2016. The state of Rio is still unable to pay its teachers, hospital workers, police and other public employees on time, if at all. Many favelas still lack running water or proper sewage removal. "The promised legacy of the Olympics achieving a safe city for all people was not delivered," Amnesty International wrote in its September 2016 post-Rio report. "Instead a legacy of human rights violations endures." Largely overlooked through much of the post-Rio commotion are the Brazilian athletes. Not only the ones like Wu, who achieved the highest levels of success, but also the next generation. Sponsors have dried up. Elite coaches have fled the country. Training centers have closed. And athletes wonder how -- or even if -- they're still going to be able to compete. In December 2009, two months after the IOC awarded Rio the 2016 Games, Brazilian president Luiz Inacio Lula da Silva walked into the country's Olympic awards celebration two hours late. Wearing the same blue tie with white, green and yellow stripes that he wore on that memorable day in Copenhagen, Denmark, he proudly received the Olympic Personality of the Year award for the role he played in bringing the first Olympic Games to South America. It was a complete change from two years earlier, when fans lustily booed Lula at the Maracanã Stadium during the opening ceremonies of the Pan-American Games. Now his popularity was soaring. That night, he chose not to read the remarks prepared by his staff and instead patted himself on the back for 28 minutes and promised "the most organized Olympics in the world." He said the Games had the power to take a kid from the favela and forever change his life. None of that could be done, Lula said, without the help of the business community -- not by signing successful athletes to endorsement deals but rather through financing the sporting structure in Brazil. Then that troubled boy could be made into an Olympic champion. The crowd roared. In the months and years that followed, Lula's proclamation was backed up with a seemingly endless stream of financial support, as the Brazilian government invested some $4 billion in Brazilian sports. The influx of cash continued after Lula's term expired and he was replaced by Dilma Rousseff. More than 90 percent of the country's amateur athletic budget came from the government. It was a crash course in buying Olympic medals, an attempt to build as many world-class athletes as possible before Rio. Wu was one of the many Brazilian athletes who benefited from the investments. He had practiced alone until 2015, when the shooting federation hired a respected international coach. His performance soared. He won gold at the 2015 Pan-American Games and a pair of World Cup titles in the lead-up to Rio before medaling on home soil. It didn't take long for the tap to shut off. "Operation Car Wash," which began as an investigation into money laundering at a gas station in the capital city of Brasilia, exploded into one of the largest bribery scandals in Brazilian history. More than 200 high-level government officials would be investigated or indicted, including Lula himself, who last month had his assets frozen and was sentenced to 9-½ years in prison after investigators found $5 billion in bribes. While Lula is expected to file an appeal, the probe is ongoing. Former Rio governor Sergio Cabral was arrested on suspicion of receiving millions in kickbacks and recently sentenced to 14 years in prison for corruption and money laundering. And officials are reportedly investigating former Rio mayor Eduardo Paes on suspicion that he also accepted at least $5 million in payments for Olympic construction projects. Coupled with sagging oil revenues, the people's lack of trust in government led Brazil into its worst recession in history. Ten days after the closing ceremonies, Rousseff was impeached, largely blamed for the country's crisis. No segment of the government was immune from scandal, including sports leaders. Coaracy Nunes Filho, the president of the Aquatic Sports Federation, and two of his directors were arrested and charged with the misuse and misappropriation of $13 million in funds, for their own personal gain and by giving favorable contracts to associates. Sensing a larger problem, the TCU launched an investigation into 10 sports entities, including Brazil's Olympic Committee. Nine of the 10 were found to be misusing public funds. The only organization that wasn't: the Brazilian Confederation of Sports for the Visually Impaired. "In our audits, we found that the situation was very serious and there was a risk of losing money and the legacy that had been built in recent years," TCU secretary Ismar Barbosa Cruz told ESPN. Athletes who had been showered with opportunity in the lead-up to Rio were now in the middle of a nightmare, a few with the Olympic medals around their necks. Wu, the grandson of Chinese immigrants who lives with his parents in São Paulo, was one example. After Rio, the contract of his Colombian coach wasn't renewed, so he is back to practicing on his own. He failed to reach the final in any World Cup tournaments this year and worries the same might happen at the world championship later this month. He still has the same lone sponsor he had before Rio -- Rifle, the Brazilian company that supplies him with his ammunition. But there's nothing new. He lives off the $1,000 a month he receives from the Brazilian army for representing it in armed forces competitions and a $4,800 monthly stipend from the government, the latter he receives for being an Olympic medalist. His complaints are less about money than the lack of stability from the government, the Brazilian Olympic Committee and his own federation. He has cut back on his travel and competition schedule and redirected his attention to an entity that can give him a far more stable future: college. At the Federal University of ABC, Wu is studying aerospace engineering. He is often recognized on the streets, people stopping him in airports or supermarkets to congratulate him and ask for a photo. But most have no idea what sport he practices; they just recognize his face as one of the Brazilian success stories from the Rio Games. The occasional fan selfie does little to quell his frustration. "Since I was 12 years old, I wanted to win an Olympic medal, but I never allowed myself to think of what it would be like to win," he says. "If I would have imagined something, I would be even more disappointed." When Ricardo Cintra gets up in the middle of the night to get a drink of water, he is still amazed. Along the dark path to the kitchen, he sees the Olympic medal pinned to the wall in the living room and shakes his head in disbelief. "I look and think, 'Wow. It's true. Poliana did it,'" he says. Cintra is one of the few coaches in the world who have the privilege of having an Olympic medal in their home. That's because he is the coach and husband of open water swimmer Poliana Okimoto, who won a bronze medal in Rio. Okimoto initially finished fourth in the 10K race, but the disqualification of second-place finisher Aurelie Muller after she impeded another swimmer at the finish bumped Okimoto to bronze and made her the first Brazilian female swimmer to win an Olympic medal. But just like with Wu, Okimoto's competitive life is now filled with confusion. With every stroke, she feels the effects of the financial crisis and corruption scandal. In September, her sponsorship contract ended and was not renewed. Now she pays her team using the $1,000 she receives from the army, her own $4,800 monthly government stipend and money she receives from her club team, Unisanta. (For contractual reasons, the club will not disclose Poliana's compensation.) She still trains at the same 25-meter Esperia Club pool in São Paulo where she and her husband pay roughly $160 a month to be members. There is no competitive team at the club, meaning it's perfectly normal for Okimoto to train in one pool while elderly women take water aerobics classes in another. To train at Unisanta, which is located in Santos, a coastal city some 50 miles from São Paulo, Okimoto would have had to move and share the pool with her biggest rival, Ana Marcela Cunha. It's a situation neither of them wanted. This summer, Poliana didn't even make the Brazilian world championship team, while Cunha won gold in the 25K, bronze in the 5K and tied for bronze in the 10K. "I dreamt about the Olympic medal since I was 13 years old," Okimoto says. "I thought it would change my life, or at least my life would be easier. Nothing has changed. On the contrary, I've lost. A lot." She still carries the memory of standing on that podium a year ago. Through the tears of the moment, she watched hundreds of fans cheer her name and wave the Brazilian flag. But today it's bittersweet. At the Maria Lenk Trophy, the first national competition held after the Rio Games, Cintra asked organizers to announce that there was an Olympic medalist at the pool. "It was a chance to remind the young people that there was a medalist there, that we should value the accomplishments of this Brazilian athlete," he says. "We go to competitions in the USA and they stop everything to announce that there is a medalist in the stands. Everyone applauds." He paused, thinking of everything that's happened in the last year, and added, "How can I motivate Poliana to continue until Tokyo 2020 if the only [outcome] is to be disappointed?" It's a fair question. And perhaps no segment of Brazilian sports has been hit harder by the post-Olympic downturn than aquatics. For 26 years, the Brazilian Postal Service sponsored Brazil's entire aquatics federation. But after Rio, that investment was slashed by 67 percent, from $5.2 million to $1.7 million a year. Earlier this year, the president of the Brazilian Olympic Committee, Carlos Arthur Nuzman, admitted that economic investment in Brazilian sports has recessed to where it was in 2000, nine years before Brazil was even awarded the 2016 Games. The postal service predicts it will close 2017 with an operating loss of $400 million. The postal workers union wanted to slash its support of sports entirely but was talked out of it. "If it was up to them, we would [have] had zero support," Guilherme Campos, ECT Chief Executive of the Brazilian Postal Service, told ESPN. "It's not about the athlete's performance, it's about our economic situation. What led us not to completely reset was our history of 26 years supporting Brazilian aquatics." At the world championship in Budapest, Hungary, last month, Brazil fielded a team of just 16 swimmers, its smallest since 2007. That was double the number of competitors Brazil initially thought it could afford to send. While U.S. athletes receive no funding directly from the government, most Brazilian athletes couldn't support themselves without their government stipends. And although the cracks in Brazilian government started long before the Rio Games, the funding continued through the Games. Today it's as much a political move as anything because it's the only money that goes directly to the athletes. "At the end of 2014, after the soccer World Cup, the country was already breaking," Okimoto says. "If the Olympics hadn't been in Brazil, our dream would have ended right there. The investments would have stopped. It didn't stop. But when that all ended, nobody had a plan. Nobody knew what to do in this new reality." Leonardo Picciani, the Minister of Sport in Brazil, disputes the notion that there was no plan. According to research done by the Sports Ministry, more than 70 percent of Brazilians agree there should be public investment in sports -- it just has to be administered the right way, free of corruption. "I do not think Brazil failed in Rio 2016," he says. "The basis of Brazilian sport was planted in terms of infrastructure and conditions for athletes to train. But the governance has to be improved. We have to waste less money and have less bureaucracy and administrative issues and instead have more athletes in more competitions." Rafaela Silva still has trouble getting out of the house to take a walk along one of Rio's famed beaches or even go to the mall. A year after she won Brazil's first gold in Rio, the 25-year-old still isn't used to the attention that has come along with her 57-kilogram victory in judo. The cruel, racially driven messages that followed a disappointing performance in London 2012 led her to almost quit the sport, but they have been replaced by words of encouragement and pride. Her social media followers have jumped from 10,000 to 307,000 in Instagram and she also has just over 72,000 Twitter followers. She trains at Institute Reacao, a nonprofit organization that promotes human development and social inclusion through sports. She is one of the children who benefited most from the project and has added a major sponsor in Nike. Though she won't say how much her sponsorship is worth, she and the owner of the institute, former Olympic medalist Flavio Canto, charge $10,000 to speak together. She knows her reality is not the norm. "In Brazil, only the gold medal is really appreciated," Silva says. "The athletes who won silver, bronze or didn't medal at all are having far more problems. These are the ones to think about." Of the 19 medals Brazil won in Rio, only seven of them were gold, including men's soccer and volleyball, sports that already had strong support in Brazil. "Before the Olympics, the crisis was already big, but the Olympics helped people forget about it for two weeks," Silva says. "Afterward, the athletes wanted to celebrate their accomplishments, but the country was waking up in the middle of more and more scandals. The media turned quickly to political issues, the economic crisis, and the athletes lost sponsorships and attention. They've been forgotten." Before the Games, Silva and her judo teammates decided they would equally divide the prize offered to Olympic medalists by the Brazilian Judo Confederation, an amount that totaled $166,000 for its one gold and two bronze medals. Instead of pocketing at least $55,000, Rafaela took home about $11,000. "Of course I would like to have had more for the medal, but we thought it would be more fair to split between everyone," she says. "We all fight the same way. This money helped those who had no sponsor." The help was needed after Rousseff's replacement, Michel Temer, suspended certain stipend programs for six months -- blocking pay to medalists from national, continental and world championships while keeping Olympic medalist stipends intact. The chance to apply for new stipends is slated to restart in August; so, under the best-case scenario, athletes will begin receiving their funding again in December. Silva worries about the impact this will have on Brazilian sports in the run-up to Tokyo. "Everybody will want a good performance in 2020, but sports are no longer a priority," Silva says. "We understand the government had to decrease the investment. How can you justify the expense of millions on sports when we have no hospitals?" The Opening Ceremony in Brazil's famed Maracanã was the most watched in Olympic history. More than 2.5 billion people from around the globe tuned in as 11,000 athletes marched on the stadium floor holding a cartridge of soil and a seed from a native Brazilian tree. The athletes placed the cartridges into mirrored towers. Olympic organizers called the procession "Seeds of Hope," explaining the containers would be planted as part of an Athlete's Forest in the Deodoro neighborhood of Rio. But now, just over a year later, there is perhaps no greater example of the Rio Games' complicated legacy. The seedlings sit in planting pots under a sheer black canopy on a farm 100 kilometers from Rio. Prior to last week, Marcelo de Carvalho Silva, the director of Biovert, the company responsible for the seeds, hadn't heard from Olympic organizers in months. He had no idea what the plans were for the seeds, but he painstakingly watched over them for free, knowing what it would mean for his company -- and the country -- if something happened to them. That's when the TCU, following up on the Olympic promises made for Rio, started asking questions. And then, sure enough, Olympic officials finally reached out. 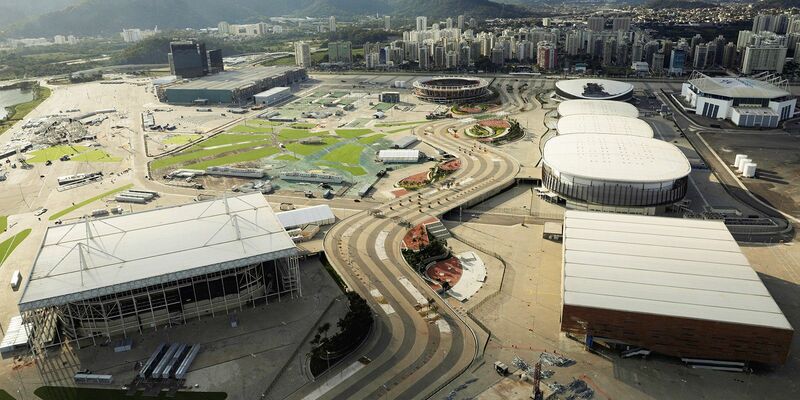 Twenty-four million seedlings were supposed to be planted to offset the environmental impact of the Games. But that has not happened. The trees that were part of Olympic Park are dying from a lack of irrigation and maintenance. The mayor blames the organizing committee; the organizing committee the government. And, as a result, there is a stalemate. "The planting of the 12,000 seedlings in the park is only a memory of a beautiful image in the Opening Ceremony," the TCU report said. "The Rio 2016 committee made a promise to the world and has now been linked, morally, to this duty. To not plant the seeds would cause significant damage to the country's image." The plan had been for the organizing committee to stage some sort of ceremonial year-after event in August or September, with big-name athletes, celebrities and volunteers coming together to celebrate this positive environmental piece of Brazil's Olympic legacy. Nothing has been planned. Silva says if August or September were the goal, he would have needed to start preparing the new soil in April. "There are still no guarantees there will be the financial resources needed for this," he says. "I don't know if this is going to happen." The organizing committee insists it has the budget to properly plant the seeds. The TCU keeps a watchful eye to make sure promises are kept and money is spent wisely. But that is the problem in Brazil: How do you invest in sport when everything else is falling apart? How do you pay to plant a forest when you can't pay the police? Where did the budgeted money go? The promises made have become impossible to fulfill, and yet the spin continues. Everything will happen as planned, they say. The venues will be used. The schools will be built. The seeds will be planted. Brazilians, however, have learned to know better. "At another time or in another country, the Games might have been different, but not here and not now," says University of São Paulo professor and longtime Olympic analyst Katia Rubio. "We climbed that initial roller-coaster ramp and took that big dive, but, in the end, there was nothing else. It was a big boost that ultimately led to nothing." Wayne Drehs Drehs is a senior writer for ESPN Digital and Print Media. Mariana Lajolo Lajolo is a freelance journalist based in São Paulo, Brazil. She previously was a columnist for Folha de S. Paulo.